The Breville BOV650XL Compact Smart Oven may be labeled "compact," but it still has a decent capacity. It toasts four slices of bread, roasts a 3- to 4-pound chicken or bakes a 12-inch pizza, and does all of those tasks very well. Big features in a small package. The Breville BOV650XL Compact Smart Oven is a smaller, step-down version of Breville's wildly popular, large convection toaster oven, the Breville BOV800XL (Est. $250). 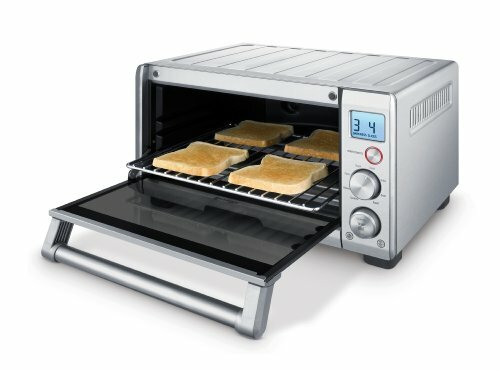 Though the BOV650XL does not have a convection function, with 1,800 watts of power and "smart" heating elements, reviewers say it cooks everything -- from chicken to pizza to cake -- evenly and fairly quickly, and Consumer Reports awards it with scores of Very Good in all cooking categories but one slice toasting -- it earns an Excellent there. The BOV650XL can hold four slices of bread at a time. The backlit LCD on the BOV650XL shows the correct time and temperature, and the oven shuts off automatically when cooking is done. Many love the countdown timer function that displays the time remaining until your food or toast is done. A number of users note that the instruction book includes some good recipes. One-touch cooking. 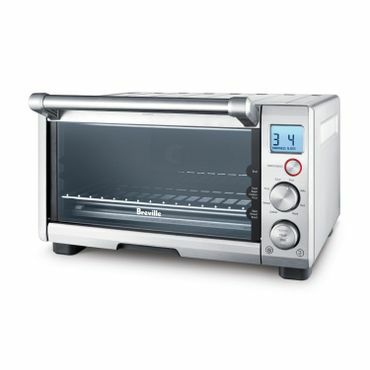 The eight presets on the Breville BOV650XL Compact Smart Oven -- toast, bagel, bake, roast, broil, pizza, cookies and reheat -- mean that many of your common cooking tasks are no more complicated than pressing a button, according to reviewers. It even remembers personal-preference settings. There are three rack positions for various tasks; however, the rack does not pull out automatically when the door opens and plenty of owners say the rack can be awkward to pull out when it's hot. The BOV650XL's interior walls feature a nonstick coating and its pullout crumb tray is easy to clean. Accessories include an enamel baking pan and broil rack, as well as a ribbed plate warming tray. None of the accessories are dishwasher-safe. A solid, mid-sized option. Although it bills itself as "compact," the Breville BOV650XL Compact Smart Oven is actually comparable in size to other mid-sized toaster ovens and, although we spotted no complaints about it being too small, we did find a few saying it's larger than they need or want. The Breville's stainless steel finish looks attractive in a variety of kitchens, and its large display and minimalist controls give it a modern styling that many reviewers like. We did read some instances where the BOV650XL died after two to three years, but they seem to be in the minority, and Breville gets kudos for its responsive customer service, even after the toaster oven was out of warranty. It comes with a one-year warranty. A good number of presets.